RIO DE JANEIRO – More than 25 years after emerging in defiance of a teetering military dictatorship, the Brazilian Landless Worker’s Movement, or Movimento dos Trabalhadores Rurais Sem Terra (MST), again forced itself into the nation’s attention last week as members occupied several government offices in Brasilia, Sao Paulo and Rio de Janeiro. 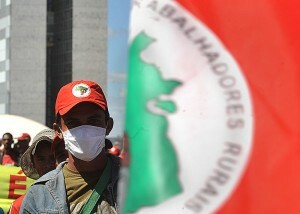 A protesting campesino protects his anonymity, photo by Marcello Casal JR/ABr. The occupation targeted the National Agrarian Reform Institute, coinciding with a much wider “day of struggle” that coordinated protests throughout the country, demonstrating for those in office the numbers that the MST is able to galvanize. “Agrarian reform is halted. There are thousands of peasant families camped along the sides of highways because they are victims of the violence of the land barons,” said MST spokesman Jose Batista de Oliveira. He added that of the commitments made by a supposedly supportive Lula government “not a single one has been fulfilled”, and that this would incline the movement therefore to radicalize it’s approach. The MST officially began in 1984, but the organization can be viewed as part of a continuing struggle that dates back to Brazil’s independence. Since the end of the 19th century, one group or another has sought to address the imbalances of concentrated land ownership in the hands of the few such as is rooted in Portuguese feudal law. This concentration persists today, and in fact the MST would say that the advent of modern agro-industrial farming has only compounded the hopelessness faced by the Brazilian peasant farmer. The figures support the MST assertion that Brazil still faces some of the worst land distribution inequality in the world. While some estimates suggest that ten percent of farm operators own more than 85 percent of arable land, the MST claims just three percent of the population in fact own all the fertile land. From humble beginnings, the Brazilian Landless Movement now wields considerable influence, and is easily the largest social reform movement in Latin America, with a membership estimated at 1.5 million affected campesinos or farm workers. The tactics employed by the movement are simple and exploit a vague clause in the Brazilian constitution, which states that unproductive land can be reallocated for a ‘larger social function’. Since 1985 the MST has coordinated peaceful occupation of disused lands while petitioning the government to grant titles, and has achieved a good deal of success along the way: According to the MST website, titles have been granted to 350,000 families in more than 2000 settlements, amounting to a total expropriation of more than 35 million acres. An MST encampment in Itaprica. 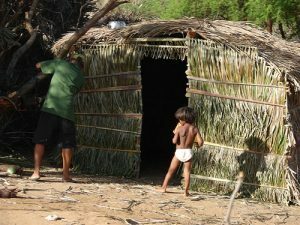 Campesinos occupying disused land often live in extrememly basic conditions, photo by Glauco Umbelino/Flickr Creative Commons License. The movement is of course not without it’s detractors. The tactics of the MST always court controversy, and have often resulted in violent confrontations with authorities and opposition alike. Hundreds of activists have been prosecuted, though being unofficial the MST itself remains out of the reach of the state. The advent of the MST predictably sparked counter measures from threatened large land owners. The Rural Democratic Union or UDR say they are defending their inalienable right to private ownership against the un-democratic invasions perpetrated by the MST, but have long been implicated in the suspicious deaths of campesionos. Land distribution in Brazil is without doubt one of the most divisive issues facing the nation. President Lula rode to power on a social reform ticket, but the pressures of international diplomacy seem to have put distance between his government and the Landless Movement. While U.S. nervousness at leftist Lula’s election has been soothed, the MST remains an influential organization that still uses words like ‘collective’ and ‘cooperative’. There are also commentators who surmise that the Landless Movement has spread itself too thin, and that Brazil’s improving fortunes are diluting the relevance of the MST. Government should stop this MST and put this lazy people to work…they just destroy the places they find, e.g. orange plantations and many other places! Have you heard about Brazilian internal deficit? A public debt of 2.2 trillion in December, or 64.4% of GDP!!! Brazil is still the land of corrupted politicians and the president maintain the situation because is convenient to to the governor! Rio de Janeiro is a live example… where is the money to clean the city where the streets smels urine? Dirty beaches…violence in the streets…if you take a camera from the bag people’s look at it as if they never see something or just thing how much would cost if they can grab from our hands…also walking in the streets it seems people never saw a foreigner, they act as if they are not in a touristic city…also many makes a bad face or turns the face when you speak another language, many they run away… The people living here now is less polite than years ago or 20 or more years ago… Rio is just a beautiful city from the top of sugar loaf but when we walk the smel and other things are not a welcome to the tourist anymore!